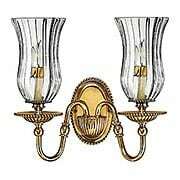 Our Classical wall sconces feature graceful lines and elegant details. 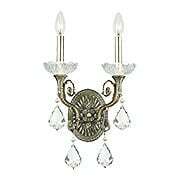 These decorative sconces look great in dining rooms, hallways, bedrooms and foyers. Choose from a wide selection of beautiful designs and finishes. 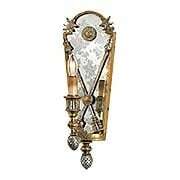 Like a treasured flea-market find, this wrought wall sconce is the essence of "shabby-chic". The surface is faux-finished to replicate vintage bronze, then lightly distressed, creating a desirable time worn patina. 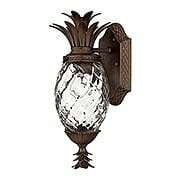 Classic in style, but rustic in appearance, it's a wonderful choice for cottage or castle alike! 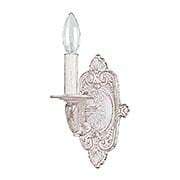 With its classic sense of proportion and elegant details, the Palmdale Wall Sconce embodies the beauty of Deco glamour. Finely reeded accents complement the stepped back plate, while a hard back shade, bell finial, and beveled curves add gentle refinement to its overall composition. 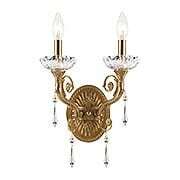 Intricate brass castings accented with your choice of two rich finishes make Murray 2-Light Wall Sconce a fitting choice for any traditionalist. 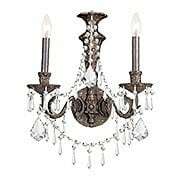 Whether gracing your dining room, bedroom, or hall, this European-style stunner shines with the utmost elegance. 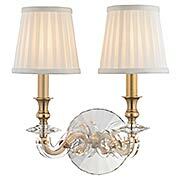 The Bella Cristallo 2-Light Wall Sconce maintains an eclectic mix of influences. This highly decorative piece features contrasting gold and bronze finishes, crystal embellishments, and pleated champagne cloth shades. 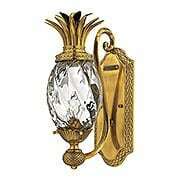 A shining example of traditional sophistication, it is an elegant addition to your entry, dining room, or hall. 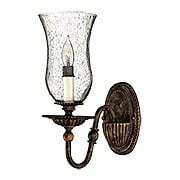 The Amias 2-Light Wall Sconce brings an elegant mix of Classical and Colonial style. 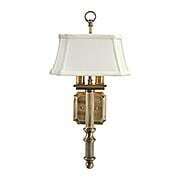 This traditional design features a decorative back plate, fluted column, and off-white softback shade. 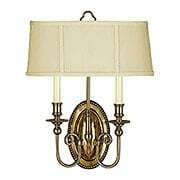 Available in an array of popular finish options, it offers a warm, flattering glow. 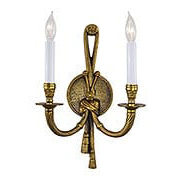 Intricate brass castings accented with your choice of two rich finishes make Murray 1-Light Wall Sconce a fitting choice for any traditionalist. 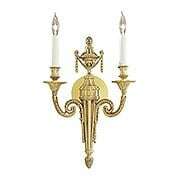 Whether gracing your dining room, bedroom, or hall, this European-style stunner shines with the utmost elegance. Crisp details and traditional influences, make the Lapeer Collection an elegant addition to any room. Pleated shades of fine silk, crystal bobeches, and mirrored a crystal-cut back plate combine to create this lovely sconce. Available in your choice of two classic finishes. 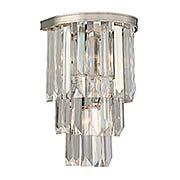 The Tierney Collection derives its distinctive style from Art Deco fixtures of the 1930s. Reminiscent of wedding cake chandeliers of the past, this modern rendition a metal ring studded with graduated columns of shining optic acrylic prisms. 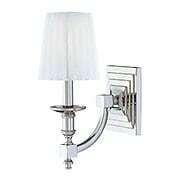 The Tierney Wall Sconce is a splendid choice for your dining room, entry, or hall. This elegant neo-classical Rope and Tassel Double Sconce is designed as an artfully draped silk rope, complete with dangling tassels. Delicate, yet substantial in scale, it strikes the perfect balance. 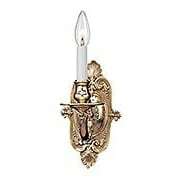 Made of solid brass with a lustrous French-gold finish. This elegant neo-classical Rope and Tassel Single Sconce is designed as an artfully draped silk rope, complete with dangling tassels. Delicate, yet substantial in scale, it strikes the perfect balance. 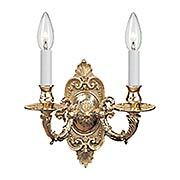 Made of solid brass with a lustrous French-gold finish. This elegant neo-classical Rope and Tassel Triple Sconce is designed as an artfully draped silk rope, complete with dangling tassels. Delicate, yet substantial in scale, it strikes the perfect balance. 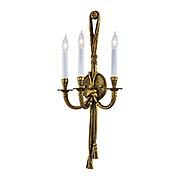 Made of solid brass with a lustrous French-gold finish. 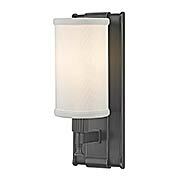 The Harris 1-Light Wall Sconce brings an elegant mix of Classical and Colonial style. 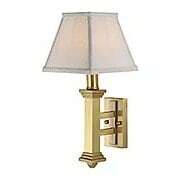 This traditional design features a stepped back plate and column and a softback shade. 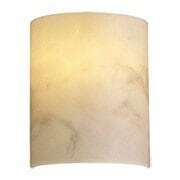 Available in two popular finish options, it offers a warm, flattering glow. 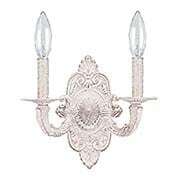 Art Deco meets Classical-Revival in the Continental Classic Wall Sconce. This dynamic design pairs crisp, geometric shapes with traditional candle arms and white pleated shades for a style that is formal, yet forward looking. Crafted from durable steel with a gleaming nickel finish. 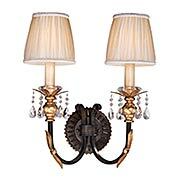 The exquisite Napoli wall sconce features a classically inspired "Empire" design. 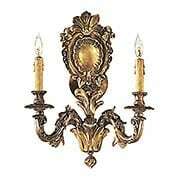 Graced with arrow and pineapple accents, in gold leaf and majestic silver-leaf finishes, it exudes lush, Italian style. What an impressive design for any room in the house! 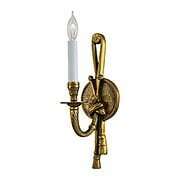 From the elegant draped urn to the tapered and fluted stem, this solid brass sconce is a fine example of Neo-Classical design. 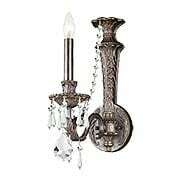 Displaying refined detail and perfect proportions, it's an impressive lighting accent for any room. 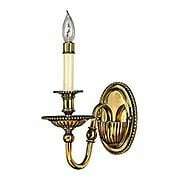 This elegant brass sconce enhances any setting, from a formal dining room to a well-appointed powder room. 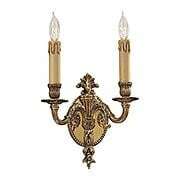 Designed in style of 1780s France, it's adorned with flowers, foliage and romantic dripping candle sleeves. A gleaming gold finish completes the period look.